Saturday March 17th 1894 Will took the team and went over home to get a plow and scour it at the river and did not come back to dinner. I had dinner early and Josie and I went to town with Pet and the buggy. She stopped to see Mrs Westenhauer about working for her. I went over home to see Hattie a little while. I then came back to town to do some errands. I went up in Otts office to write to Dewitt Miller at Dwight. I got home before Will did. It was summer heat today. I read a little in the evening. I was very tired. went to bed. I had a letter from Lizzie Duncan, Flora is very sick. 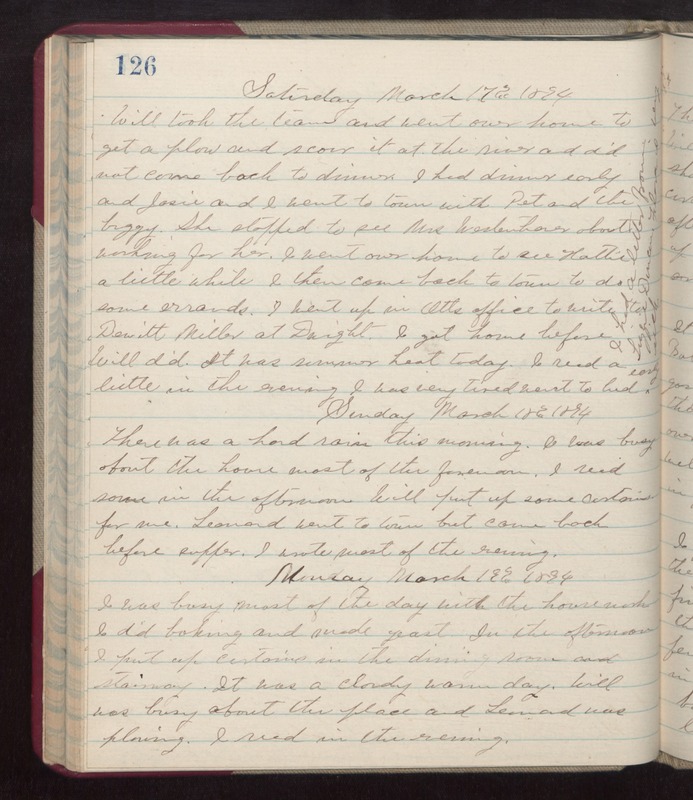 Sunday March 18th 1894 There was a hard rain this morning. I was busy about the house most of the forenoon. I read some in the afternoon. Will put up some curtains for me. Leonard went to town but came back before supper. I wrote most of the evening. Monday March 19th 1894 I was busy most of the day with the housework. I did baking and made yeast. In the afternoon I put up curtains in the dining room and stairway. It was a cloudy warm day. Will was busy about the place and Leonard was plowing. I read in the evening.